The Climate Resilient Infrastructure Services (CRIS) program was an initiative of USAID’s Climate Change Resilient Development (CCRD) project. 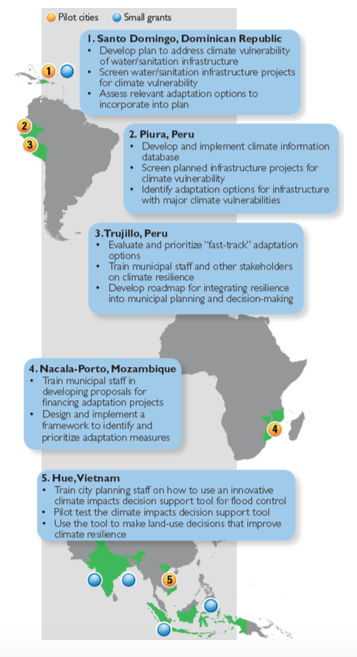 CRIS worked to improve the ability of cities in developing countries (see Figure 2, right) to provide reliable and sustainable infrastructure services that support smart and lasting development, even in a changing climate. For two-and-a-half years the CRIS program worked with cities to develop, test, and implement approaches to improve the climate resilience of infrastructure services. These services—which include transportation, water, sanitation and waste management, energy, communications, and shelter services—are essential to cities’ ability to create healthy, sustainable, and thriving communities. Cities need technical support to implement a “development-first” approach using USAID’s Climate-Resilient Development Framework. Support for cities should focus on building internal technical capacity, improving access to local experts, and strengthening relationships with provincial and national decision-makers. Internally, capacity needs to be built among technical staff, particularly within capital investment, planning, public works, emergency management, and environment departments. City staff can be empowered to take action by learning from their peers and participating in interactive training. The private sector is a large funder of public infrastructure and requires a distinct strategy for engagement on urban climate resilience. Involving the private sector requires a different approach and level of effort than that for civil society groups and academics. Engagement should start with current city priorities and be tailored to local decision-making processes. Cities are eager for user-friendly tools, tailored to their needs and processes. Tools should be replicated through modular components that can be tailored to different local contexts. Well-designed city pilots enabled USAID to develop and test innovative climate resilient solutions in different contexts over a relatively short period of time. In CRIS pilot cities, the program developed significant capacity for understanding and responding to climate change impacts on urban infrastructure. Cities have taken steps to mainstream climate change considerations into their decision-making and governance systems. CRIS delivered nearly 3,000 person-hours of training to 340 men and 200 women in CRIS pilot cities. The program contributed to the proposal, and in some cases, adoption, of seven policies, ordinances, plans, or agreements addressing climate change at the municipal level. The program developed, tested, and implemented practical tools in collaboration with city pilots and grantees that are valuable resources to inform resilience work in other urban contexts. Cities will have better access to climate information for decision-making, as well as approaches to identify and disseminate actions that increase resilience to climate change. By testing the USAID CRD Framework, CRIS validated its development-first approach and made real progress toward implementation of adaptation measures in pilot cities. CRIS validated peer learning strategies as an important program component for building momentum, strengthening learning, and creating ownership over program outcomes and follow-on work. Each pilot city has improved prospects for continued support of climate resilience work through USAID Mission programs, donor interest, or national government collaboration. Develop practical approaches to evaluate the net benefits or cost-effectiveness of adaptation options. Cities need better metrics, such as net present value, internal rate of return, or cost- effectiveness that can help them select adaptation options. Translate climate projections into decision-ready information and disseminate it to cities. Future efforts should continue to focus on helping cities interpret climate information in terms that they understand and are relevant to their responsibilities. Develop core components to design tools that are tailored to cities’ own local contexts. Instead of disseminating specific tools that do not scale well to other contexts, practitioners should focus on sharing modular components that can be combined to generate tailored outputs that align with municipalities’ own decision-making processes. Link municipal-level adaptation strategies to provincial and national planning. Donors and practitioners should promote stronger links between cities and regional and national governments. Relationships can be built through peer learning events and by implementing programs that help cities and regional actors work together. Target the private sector in urban climate resilience strategies. Future programs should test the effectiveness of engaging the private sector as a primary means of promoting urban resilience, and compare this approach with programs focused on local governments. Read "Shaping Climate-resilient Development- A framework for decision-making"
Aditi Paul of CDKN Asia reflects on the revelations in the IPCC’s 1.5°C Special Report and its implications, including key messages for cities. Suzanne Carter, CDKN Country Engagement Coordinator, highlights why we need to start seriously considering the risk of extreme heat in African cities, following the release of the IPCC’s 1.5 Report. This report from USAID Adaptation Thought Leadership and Assessments project examines the benefits of Green Infrastructure in improving a city's overall resilience to climate variability and change. InnovCities surveyed 96 cities to assess the extent to which institutional innovation has been seen on the ground to adapt to urban water risks under climate change. To improve the capacity of research and training institutions in developing countries to support climate change adaptation and mitigation action.